We’re in Chartres, just outside of Paris. Marveling at perhaps the world’s greatest Gothic cathedral, we see the finest surviving medieval stained glass in Europe. And with one of Europe’s best art teachers, we gain an appreciation of how the exquisite windows reminded the faithful of Bible stories. 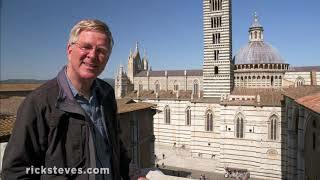 If the cathedral seems big for its town, that's because it was huge on the pilgrimage trail. People came from all over to see its precious relic: the veil, or gown, it's believed Mary wore when she gave birth to Jesus. In fact, when the earlier cathedral burned down, that veil was found miraculously preserved. Conveniently, this was great for fundraising. As Christians from far and wide gave generously so Chartres could rebuild its cathedral grander than ever. The nave is vast, over 400 feet long and the widest in France. The Gothic structure allowed for plenty of windows. Chartres contains the world's largest surviving collection of medieval stained glass with over 150 early 13th century windows. The light pouring through these windows was mystical and encouraged meditation and prayer. Stained glass was used to teach Bible stories to the illiterate medieval masses and it gave worshipers images to focus on as they prayed. The English scholar Malcolm Miller has dedicated most of his life to studying this cathedral and sharing its wonders with visitors. Most of what I know about this church I learned from Malcolm. 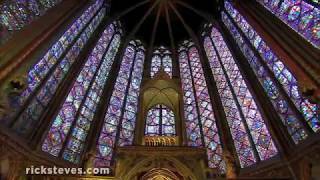 Malcom: Chartres Cathedral has the world's largest collection of medieval windows. 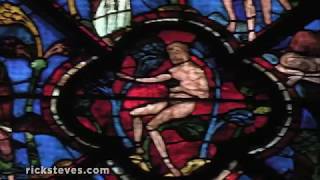 Over 150 original windows of the 12th and 13th centuries. The oldest ones, if you turn around behind you, beneath the rose window, I want to start with those. Most of the windows are read bottom upwards. The idea is from earth to heaven. Like the architecture, it goes up, it's uplifting. They're around a special vivid quality of the blue, this luminous blue, made from cobalt. This time we just look at a few scenes. The second up on the left, The Last Supper. On the right, Jesus is washing his disciples' feet. 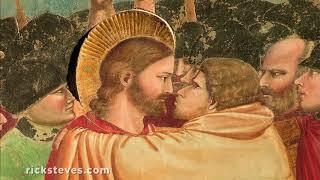 Thirds on the left, betrayed, the Kiss of Judas. Next to Roman law, whipping, flagellation, crucified him, four from the left, and the cross in green — color symbolism because of a belief that the cross was made from the Tree of Life, that grew in the Garden of Eden and living wood is green. That's use of color symbolism. The left windows ends with the living Christ resurrected. An importance of Chartres for us in the 21st century, is that it's come down to us — it's amazing — nearly intact. We can still read Chartres Cathedral like a book.